Dunwood Park covers an area of approximately 12 hectares and lies midway between Rochdale and Oldham. It is located one mile north of Shaw town centre within Beal Valley. It is managed by Oldham Countryside Service. Here you can take part in activities such as walking, picnicking, nature studies, tennis and bowls. You can discover and enjoy its wooded hillside with views across the Beal Valley towards Crompton Moor, Shaw, Oldham and Rochdale. Of crucial importance for the future of Dunwood Park was the progress of the Big Lottery Bid for the redevelopment of the park. This bid was promoted by Oldham Borough Council and the Friends of Dunwood Park, and is supported by the Dunwood Community Partnership. The land at Dunwood was gifted to the people of Shaw by Captain Crompton in 1911. He sought to provide a green space which could be used by the community for rest and relaxation. The local Councillors then provided the early facilities to enable his dream to be realised. In 1912 these worthies gathered to open the park to the public. For many years Dunwood Park enjoyed the good times. A pavilion was built, and an excellent bowling green has attracted many bowlers over the years. Tennis courts were provided and a children’s playground added. The parkland and woodland paths were trodden by young and old. More recently however much of the park has fallen into disrepair and is now of limited use. Paths have eroded reducing access to this valuable and unique woodland. Despite the neglect Dunwood Park is held with great fondness in the hearts of the many who, to this day, spend a significant part their youth under (and sometimes up) the trees of Dunwood. Dunwood Park is a very special park and unique in this area. It begins life with its feet firmly planted in the urban heartland of Shaw and Crompton. Its formal design of play areas, bowling green and tennis courts provides a welcoming and familiar feel to the entrance to the park. Walk a little further into the park and you find a more informal parkland rising through a narrow neck of land which soon opens out into a heavily wooded area. Here are many pathways overlooking the valley of the river Beal which enters the park as your path opens out into a green amphitheatre. This wooded area is the home of many animals and birds. It is also the well loved playground of many young people and a theatre of memories for many older ones. The woodland comes to an end as you exit the park. Your path has led you to a site of the industrial history of Shaw, the Jubilee which is now maintained as a nature reserve. From the Jubilee you can move out on a number of pathways over Crompton Moor. Over the last 6 years The Friends of Dunwood Park, a community group which now has over 150 members, with the backing of the Parish Council and the Area Committee of Oldham Council have worked with the Oldham Parks Department on a number of lottery funded projects, Drainage has been repaired woodland paths have been improved, repairs have been made to the pavilion roof and a new children’s play area has been provided. Dunwood Park was 100 years old in 2012. The heritage of this park has been restored. The Friends of Dunwood Park together with the Parks Department have gained the support of Oldham Council and have jointly put forward a bid to the Big Lottery Fund, labelled the Big Lottery Bid, for the resources needed to restore the park and achieve Green Flag status. On 31st March 2010 we learned that the Big Lottery and Heritage Lottery had awarded £1.09 million for the planned renovation of Dunwood Park. Congratulations to everyone involved. 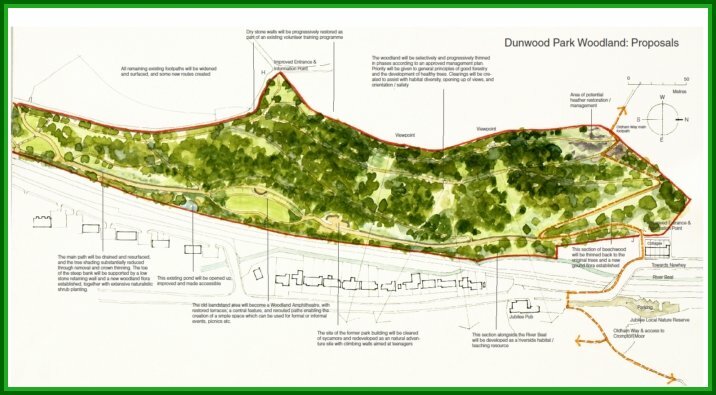 Below are the outline proposed plans of the development for Dunwood Park. The first image shows the improvements planned for the Playpark, Bowling and Tennis facilities, and the parkland. The second shows the proposed changes to the woodlands.